0045 hours Came of deck at 0000 hours. 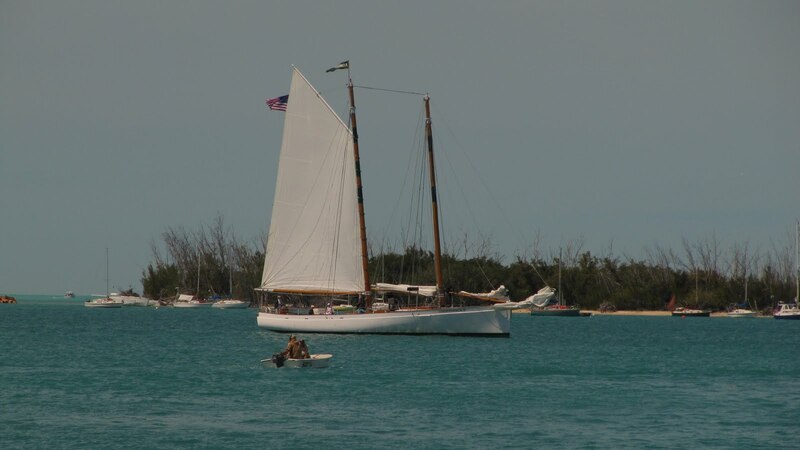 bill thinks we may need to shut down the autohelm so that we will have power when we arrive at Key West. He has asked me to load the channel markers into the C-176 in case we lose the instruments and have to hand steer the final approach to Key West. The stars are amazing tonight. there is a huge spectrum from very bright to the faintest. The milky way is so well defined that it looks like a big highway up there. Between shifts I layed in my bunk and watched the sky bob and weave through the hatch. it’s night like tonight that cause people to refer to the stars a s jewels in the sky. About 10 minutes ago the wave action got dramatically higher… the water temp went up 2 degrees and the speed over ground dropped 2 knots while boat speed stayed constant…. Yup we must be in the Gulf Stream… Thank you Mr. Hemingway. The traffic has increased allot and it is getting nerve wracking. I just overtook and passed a passenger liner who is literally crawling into Miami. I’m amazed he has steerage. A large tanker crossed my bow going like a bat out of hell. At first I couldn’t tell his course and wasn’t sure if I had to change course to avoid him but before I knew it he was crossing 2000 yards ahead of us. It’s hard to get a good view of the whole horizon from the pilot house so every 5 minutes or so I go out to the port and starboard wings to check the blind spots. This time just as I popped my head out the bow dipped and I got a face full. Seems like I catch one at least every watch. 0445 Hours Bill is pulling overtime, I think he is jazzed to get to the U.S. and right now we are still in the Gulf Stream and only 6 hours out. The wind is against the current which has built the seas to 6-8 feet with short intervals. I’m glad we are catching it on the quarter instead of the nose. I’ve had enough of the “rocking hose treatment”. We are surfing along very nicely. Kinda fun! The moon is lighting up our trail and making a beautiful scene. It’s not an angry ocean but it sure is a powerful one. The Coast Guard is broadcasting about a mayday that was reported earlier but no word from them and they are not sure if it is for real or not. 0830 hours One hour out of Key West! We are trailing 3 ocean liners. A dolphin came out as if to welcome us back. Funny we only saw dolphin on the first hour of the voyage and the last hour. The coast guard cutter came by for a look and I’ll bet they have already crossed checked us with the position report they took leaving Puerto Rico. We passed over the Gulf Stream Ridge 40 minutes ago and the bottom is slowly coming up … 180 feet right now. Here comes the “Coasty” who has taken position 2500 yards off our port beam as we enter the approach to he channel. 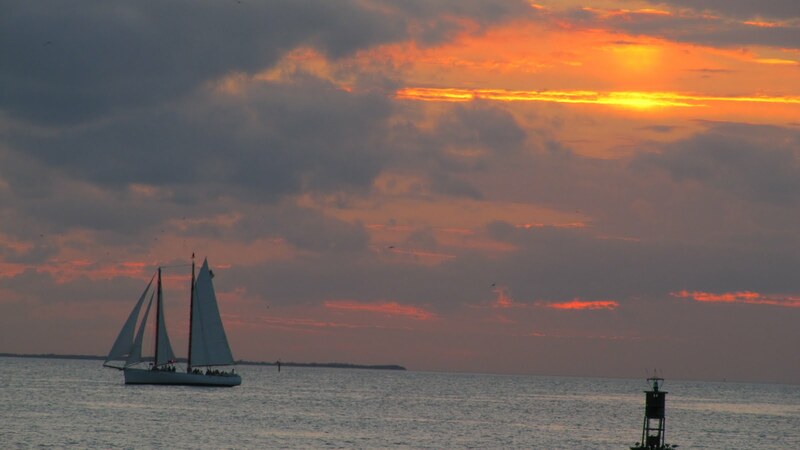 It’s beautiful, Key West ahead and a beautiful sunrise, trailing seas…what more could I ask for? The end of a great voyage.